Reliant Yachts has tweaked a tried-and-true concept to produce a subtly distinctive down east yacht. Rakish may be the best word to describe the persona of this Reliant 40 Commuter. 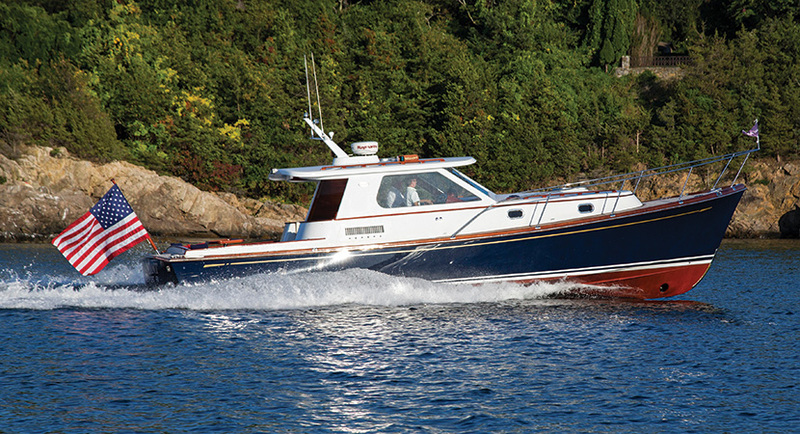 In spite of her designers’ homage to workboats from an earlier era and the popular modern interpretation of their styling, the Commuter remains dashingly dissentient—a rapier in a sea of broadswords. At first glance, you may miss her distinctive characteristics, because they’re subtle. She’s narrow, given her length-to-beam ratio of 3.3, particularly when stacked up against the 2.5 to 3.0 of other 40-footers. You’d see this difference clearly if the Reliant were berthed next to one of her broader cousins. Her sheerline sweeps aft, tracking inboard in plan view, from a proud bow to a tumblehome transom, creating a surprisingly low profile. This element of the design surprises me, because the concept of low profiles disappeared long ago, chased away by the need for increased interior volume. The compromise here is a tall trunk cabin, but by golly it doesn’t interfere with this yacht’s aesthetic harmony. Raising the overhead within the trunk cabin gives the 40 all the headroom it needs in all the right places—the galley, head, and foot of the berth in the stateroom. Portlights and a varnished teak eyebrow help disguise the height.